Today's Photo of the Day comes from Sony Artisan of Imagery, Vivienne Gucwa. Most people hunker down inside during a snow storm, not Vivienne. She sees it as an opportunity to photograph another aspect of the city she loves and calls home. We reached out to Gucwa to find out more about how he made his photograph. My passion project is taking photographs of New York City at night in harsh snowstorms. 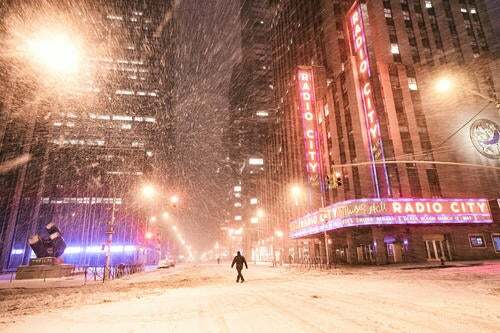 I took this photo during one of the rare times in New York City when all cars, buses, and taxi cabs were banned from the city streets due to the storm. I walked 7 miles that night all around Manhattan relishing the emptiness and beauty of a city allowed to rest. I took this halfway through my photo-journey. There were barely any people walking around and the few that were really stood out especially in places like this where the streets are usuallyteeming with activity and the hustle and bustle of the city. Shooting with the Sony α7 II helped me to capture this moment since I was able to shoot at extremely low shutter speeds due to the image stabilization. This allowed me to capture the motion of the snow coming at me along with all of the city light. To see more about Vivienne Gucwa's photography of New York in snowstorms, take a look at the article Vivienne Gucwa Explores New York Buried In Snow. You can follow Vivienne on Instagram @travelinglens and this week she is also taking over @sonyalpha. See more of the best of #SonyAlpha photos on our Social page.